I bought some old Punch magazines at an estate sale, and in reading through them, I have found interesting editorials and repeated pleas for people to stop killing birds, if for no other reason than that birds prevent insects from eating the crops. 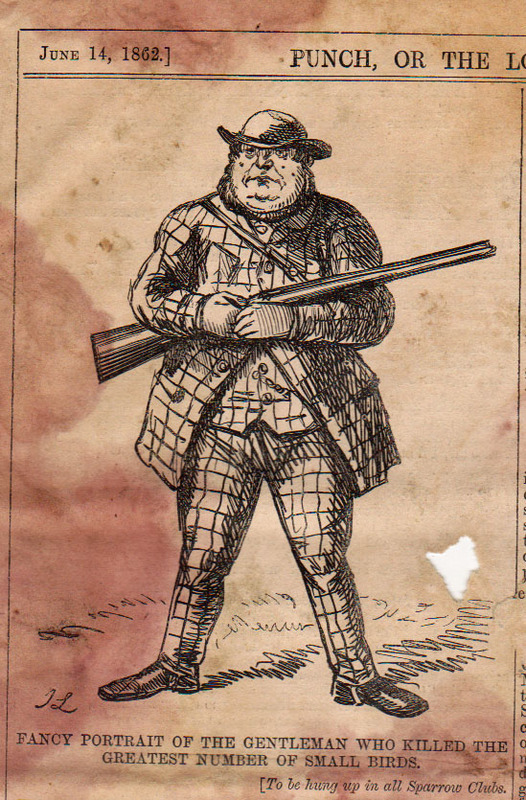 Caption: Fancy Portrait of the gentleman who killed the greatest number of small birds. From the June 14, 1862 Punch. Farmers and gardeners will gape and stare when they come to learn the fact that grubs and caterpillars are now doing immense mischief in many places and especially in the neighborhood of Liverpool, all because the fools who cultivate the soil have had nearly all the little birds killed that would have kept them under….Our clodhoppers labour under a sad mistake in supposing that small birds live chiefly upon fruit and grain, thus consuming large quantities of human food. The grub which they eat most of is not good for man; it is a maggot, and a noxious one, which devours an amount of produce very much exceeding their [the birds] little pickings. The bushels of corn, currents, raspberries, and cherries which used to be swallowed by them, are few in number compared to the bushels of caterpillars which abound in consequence of their destruction. From Punch, January 11, 1862. 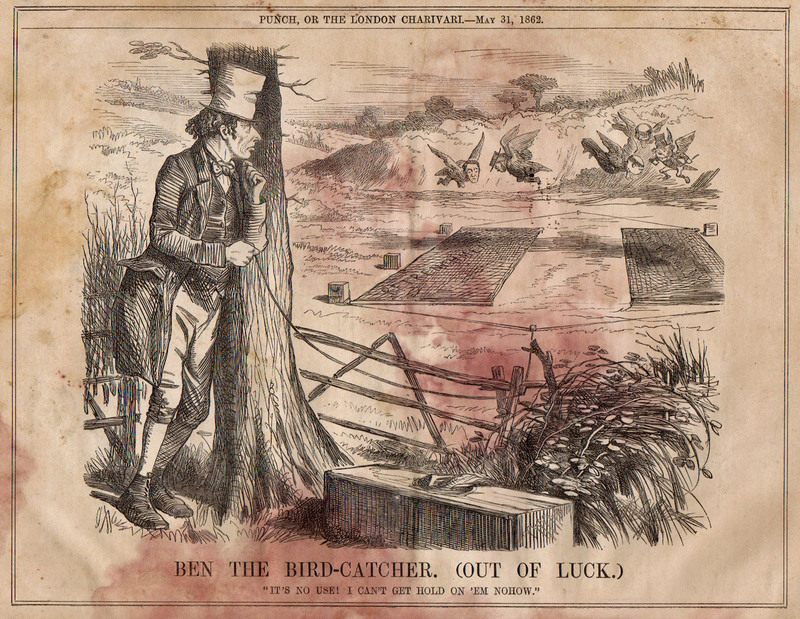 This is a political cartoon about Benjamin Disraeli, but it shows one method used to trap birds in the 1860s. I cannot find this issue of Punch online to link to. Both of the editorials I have quoted from were much longer, and by our standards, full of political incorrectness, but I think it’s interesting that people were writing about the importance of conservation so long ago. I was very interested to read how long ago people were protesting about the wanton killing of birds. I was thinking about this on our walk earlier this week round Holy Island because I had read in a 1974 book (really quite recent!) that “For that most rugged of all sports wildfowling, Holy island is superb.” “Rugged” sounds so manly, so approving – and this is a habitat for treasured species! I wonder if “Wildfowling” is considered acceptable in Texas? I guess that it is such a large state that there are bound to places where people do take pleasure in hunting birds. Hunting of all kinds is very big here, but now the hunters have really turned to conservation too. They know that it is easy to hunt things to extinction, and they enjoy the hunting experience, so they buy up land, run educational seminars, etc. Most of the western half of Texas really isn’t good for anything else but wildlife – a ranch of 20,000 acres sounds big, but the land is so arid that it can really only support 400 cow/calf combinations well. You can’t grow crops or hay on it. But the wildlife eat different plants than the cows, so ranchers can have hunting operations too and make more money that way.